Today CD Projekt Red held a small conference to shed further light on their highly anticipated game, The Witcher 3: Wild Hunt. Originally meant for a 2014 release but delayed earlier in the year, today the company announced a definitive date, February 25th, 2015 on PC, Xbox One and PlayStation 4. The game will see a standard, collectors, and two digital options, one exclusive to GOG.com upon release. The “Standard Edition” will include the extra’s that Witcher fans have come to expect from the fine folks at CD Projekt Red, including a Compendium, stickers and map and digital versions will also see some soundtrack and art additions. 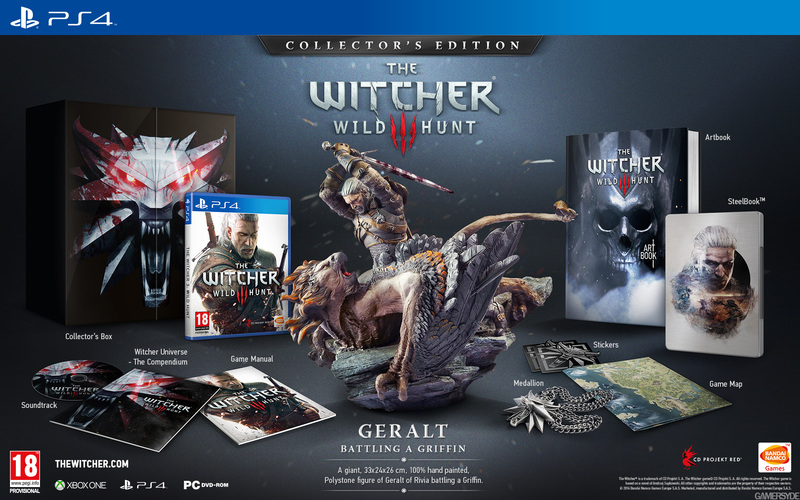 The “Collectors Edition” will feature an Art Book, Steelbook and the awesome Witcher Medallion. The real star however is a large Polystone statue of Geralt of Rivia battling a Griffin. The Witcher series is one of my all time favorites with incredible depth and storytelling that is rarely seen these days and the Witcher 3 looks to be upping every aspect of its features to give gamers an unbelievable experience. Check out below for the games stunning new trailer, an unboxing video and a closer look at the Collectors Edition content.